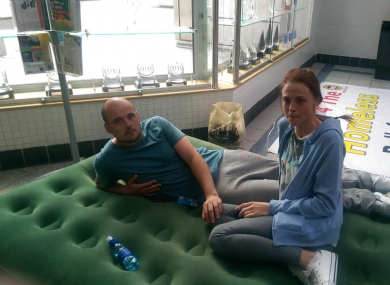 The couple slept in South Dublin County Council last night after being homeless over a week ago. SOUTH DUBLIN COUNTY Council took an injunction against a couple who slept at the council after they became homeless just over a week ago. Alan Murphy and Kelly Gilsenan have now left the council. The couple were forced to leave their private rented accommodation as the landlord sold the house and they have not been able to find anywhere they can afford to rent. They arrived at South Dublin County Council on Wednesday, where they stayed during the day. They stayed overnight last night and planned to stay over the weekend. We slept in a tent beside the canal for a week. We felt we had no choice but to bring the problem to the Council’s door by staying overnight here in the Council. Alan and Kelly were handed the injunction at around 7pm this evening and took the decision to leave due to Alan’s health condition. Alan previously explained, “I suffer from serious epilepsy since 2010 and was in a coma a couple of months ago and since the coma, I’ve been in the hospital about 15 times. I’m on 15 tablets a day and Kelly is not only my girlfriend, she’s my carer as well. Stress can cause me seizures, which is an additional reason that we need a suitable roof over our head. Supporters of the couple have arranged for them to be put up in a hotel for the weekend. TD Paul Murphy from the Anti-Austerity Alliance said, “The brave stand taken by Alan Murphy and Kelly Gilsenan over the last days has done a real service in highlighting the acute crisis of homelessness in this state. South Dublin County Council’s response to the occupation was heartless. They ran to the High Court to seek an injunction to stop Alan and Kelly staying there. South Dublin County Council’s case for an injunction against them will be heard at the High Court on Monday at 11am. Email “Homeless couple sleeping at council had an injunction taken out against them”. Feedback on “Homeless couple sleeping at council had an injunction taken out against them”.